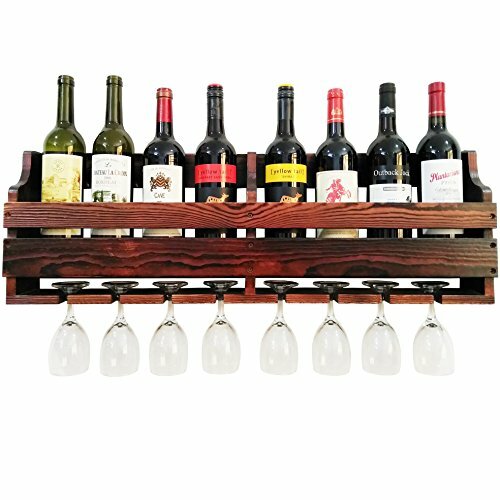 This unit is made to hold 8 wine bottles and 8 long stem wine glasses perfectly, and Shipped in the USA. ★√ Solid and strong is its biggest highlight! After installation, it will not shake on the desktop! Durable! Its structure is a triangular bracket, supporting 7 bottles is absolutely very stable! ★√ Pace saving, super practical is its second advantage, because it can not only put 8 bottles , but also can hang 8 Glasses Stemware ! ★√ Product are carefully selected, not ordinary small screws, will not rust! Screws are thick and strong!The normal service life can reach at least 10 years! ★√ Solid wood, pine! Color is the most classic walnut color, this color is not exaggerated, does not fade, classic match! ★√ Applicable to the living room, kitchen, wine lovers, bars, parties and other occasions! Elegant style, high quality! ★√ Installation requires only 2 steps! It only takes 5 minutes to get it done. The packaging is very good and very strong! Suitable as a gift! ●★ Each product is selected by our carpenter master, polished, grooved, colored, QC, packaged, and then delivered to your hands. Each step is carefully completed, each product is passed through Strictly selected! -Wall hangers are already mounted at the back panel. ★★ Wall Mounted Wine Racks. Shelf for 8 bottles, hangers for 8 wine glasses.Wall hangers are already mounted at the back panel. 【Super Solid !】 Natural pine, high quality walnut retro color! Clear wood texture! Highest carpenter craft! Tasteless, non-toxic, environmentally friendly and healthy! 【Super Easy!】Installation requires only 2 steps! It only takes 5 minutes to get it done. No extra assembly is required. The complete product will be received. The package comes with installation tools. The tools are very solid! 【Super stable!】 The entire product has 27 copper screws stabilizing , which are very stable and have a service life of at least 10 years! If you have any questions about this product by TUORUI, contact us by completing and submitting the form below. If you are looking for a specif part number, please include it with your message.